Earlier this month, Joel turned two. Two years old. Already. Finally. It’s confusing. I think we all deserve medals. To celebrate, we took both children to the park. Followed by pizza with the family. I know. There ain’t no party like a toddlers party. In fairness, we took them to a good park. Full of wooden play equipment, natural building materials and opportunities for risk-taking. We even ate marshmallows. It was quite the treat. Joel had a wonderful time. Running up hills and flinging himself down slides. Bouncing on the trampoline and greeting every new child with a shout of “Hello, friend.” He’s delicious. Elvie was struggling. Partly because it wasn’t her birthday. So she wasn’t allowed to open the presents. Partly because it hadn’t been her idea to go to the park. And partly because, after the Great Bear Hunt of 2014, she hadn’t been allowed to take her special night-time teddy with her. All in all, she was less than impressed. Which she made very clear. I would have heard her screams even if I’d stayed at home. The swings were the final straw. I was pushing her, like the dutiful mother I am. Except that I was pushing her ‘too high’, or ‘too slowly’, or ‘too wonky.’ Continually. For about ten minutes. At which point, considering that I didn’t even want to push her in the first place, I decided that I’d had enough abuse for one playtime and left her to it. I muttered something about how she should try to use her legs, and sat down to imagine that I had, in fact, stayed at home and was curled up in bed with a cup of tea. Wes took Joel to play in a tunnel, and I was left with a human tantrum. Of nuclear proportions. I had a lot of sweet, kind, empathetic smiles from other parents. Whilst I watched their children swinging. By themselves. Using their legs. On reflection, there probably would have been better times to point that out. Suffice to say, the screaming continued. Eventually, something inside me broke. As it usually does. When I get beyond the point of anger and frustration and annoyance, and remember that actually, Elvie is my daughter. In every possible way. That underneath the screaming is usually a fear that she can’t quite put her finger on yet. Like I said, she’s my daughter. In every possible way. It took a long time. A lot of gasping, and snot, and false starts followed by more raging tears. But we got there in the end. Not of the swings. But of the swinging. The new challenge. The risk. Scared of getting it wrong. My sweet four year old was so scared of not being able to swing properly that she had spent half an hour screaming at the top of her lungs. And come perilously close to spending the rest of the afternoon in the buggy. My wild, crazy little girl. Who, when given the materials to make a bear-ear headband and an outfit for her teddy, created this. 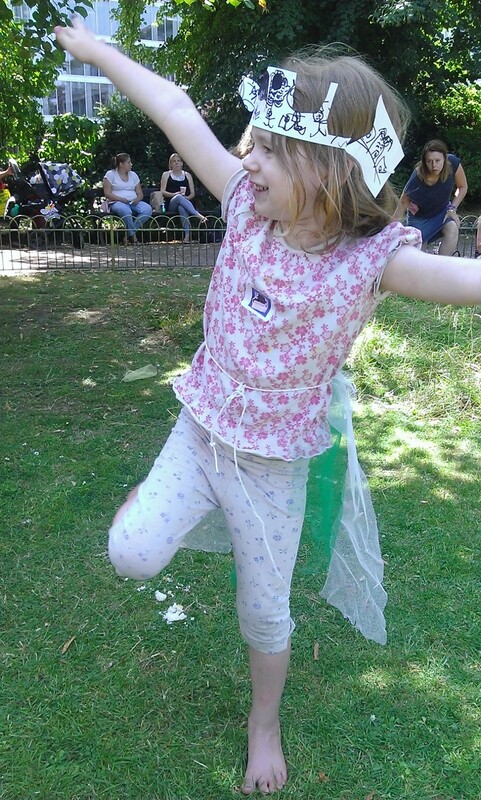 A tiara and a fairy skirt. For herself. She’s never been one to play exactly by the rules. She’s an incredible negotiator already. She is driven by an insatiable urge for perfection. By a desperate fear of not being good enough. By the preference for self-sabotage over embarrassment. We had a long chat that afternoon. Sitting on the grassy slope, looking at the swings. A chat about being brave. And taking risks. About right-or-wrong not being the most important issue. About trying. And learning. And making mistakes. And trying all over again. She got on the swing. Eventually. All on her own. She tried to move herself. To use her legs. And when she couldn’t, I pushed her. This time, she didn’t whinge. So much. We’ve had a lot of these conversations lately. Me and my girl. I’ve tried to praise her for trying. Rather than succeeding. To not jump on her if something goes wrong. To let her help. Even when it makes the process painfully, tooth-pullingly slow. Which makes yesterday even more ironic. When, after a day of painting playhouses, reviewing and renewing prescriptions, and fraught school runs, I found myself weeping into a bowl of Phish Food. Because I wanted to write a book. But I couldn’t bring myself to start. Because I’m scared. Scared of getting it wrong. Because of my own insatiable urge for perfection and my own desperate fear of not being good enough. Because of the voices in my head that tell me I’m deluded. Because I’d almost rather end up sad and bitter than try and fail. Last night I heard my own words parrotted right back at me. Not by Elvie, thankfully. That would have been a bit too much. Besides, she would have wanted my ice cream. By Wes. Who sat with me and hugged me, and told me in no uncertain terms to stop fannying around and get on with it. So here I am. Procrastinating a little, admittedly. But I’ve looked up publishers. And literary agents. And submission guidelines. I’ve made a reading list. And, so far, stayed off Pinterest. I am beyond terrified. If you try to talk to me about it, I might throw up on your feet. Sorry. In advance. It will all be worth it in the end. I hope. Either way, I’ve heard it’s the trying that counts. Meet you at the swings?